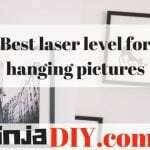 Hello ninjaDIYers, in this short “how to” article we are going to take you through few steps that you need to take when grading with a laser level. It is an integral part of any construction, renovation or maintenance project. It helps one achieve a stable, flat surface upon which you can carry out the rest of the work. To any construction worker or DIY enthusiast, a laser level is a must-have tool in their toolbox. Using a laser leveling tool is however not much of a challenge for experienced construction workers and pro DIY enthusiasts. With the proper guidelines and instructional materials, you can use this tool to significant effect on your construction or maintenance project. For first time users, below is a complete guide on how to use a laser level for grading. Connect the laser level equipment to a power source such as batteries or a power socket. Different laser level brands are designed to operate using varied power sources. Proceed to ensure that the ground upon which you are going to place the tripod holding the laser level is firm. The latter ensures that the equipment does not move from its designated spot. With the tripod in the right place, lay out the tripod legs and ensure that you maintain equal distance between each of the legs. Firmly press the pins of the tripod to the ground. Setting the tripod firmly on the ground ensures that you get the best results. Once the tripod is stable, proceed to turn on the laser level. For self-leveling laser devices, you might want to give it some time to self-level. This might take a couple of seconds. Another option would be to set the level physically. To perform a manual level setting, check if the laser level bubble and the tripod bubble are on the same level, make any necessary adjustments. For projects outside the house, it is recommended to use self-leveling laser equipment. Otherwise, any laser level device will do just fine. The price of self-leveling equipment is higher than for a manual laser level. Level rods or grade rods help to set the height. Some of these rods come with a ruler that is handy for measuring the height. In the absence of a ruler or calibrated rod, you can use a measuring tape to find out and set the height of the grade. The grade height requires adjustment with the leveling rod. In some models, when the alarm setting is on, the automatic safety lock system activates. Place the laser detector at a position where it can pick up the laser. Turn on the laser beam. If necessary, adjust the position of the laser detector so that it connects with the laser beam. When the detector picks up the perfect spot, it will make a beep sound. If not, there will be no beep sound. Place the rod at different positions so that you can figure out if the ground is below or above what you are looking for. To get authentic readings you might need to move the rod up and down. For outdoor construction projects, you need powerful laser level equipment which gives off a strong signal. Grading using a laser level is a relatively simple task. With properly functioning equipment, you can manage to achieve the desired results. Several factors can come into play as far as the performance of laser leveling equipment is concerned.Depending on the specifications, your equipment can be able to work well both in outdoor and indoor construction projects. In summary, laser levels come accompanied by an operator’s manual which show’s users exactly how to use the equipment for grading.These operator’s manuals are most useful to individuals who have little to no experience using this kind of instrument. We do recommend you for this task to use one of these 2 items … depending on what your job size will be.